... and You Can See That Even From Afar! Seriously, NOT Joking at all! When you want to cosplay your favorite Twilight Saga Characters (ex. Edward Cullen, Alice Cullen, Rosalie Hale and especially Dr. Carlisle!) This is definitely the base makeup for you and I'm not even cracking a joke at all! I got the VDL Beauty Metal Cushion Foundation with SPF50+ PA+++ last year and I can't seem to really use it on my whole face! I actually use this because of the lovely coverage and brightening effect but I apply only on certain areas. You'll know why after the jump! But trust me when I say, VDL nailed it with the packaging, one of the prettiest and classiest Cushion Compact I've seen! As compared to other Cushion Foundation packaging, this actually comes with a detachable tray and this try is actually meant to lock in moisture prevent your BB cushion from drying out fast! According to VDL, the Metal Plate™ Technology is designed to keep the low-viscosity foundation cool and maintains the moisture level of the foundation while providing mild anti-bacterial benefits to reduce contact point between the application sponge and the foundation itself. Great idea about the hygiene portion but truth be told, I can't seem to understand much about the "moisture level" but this foundation indeed kept my skin moist all throughout usage, so the metal plate must be doing its' job or maybe, it also has to do with the formulation of the foundation! This is actually the darkest shade which I think is a tad bit light on me! Using this on and off for a couple of months (more than 6 months), I guess, I can finally rest my case and tell you after this post if I like this product or not! Let me break it down for you the pros and cons. The "metal plate" is wonderful in terms of making sure the product is kept safe and clean all throughout usage. It is also easier to clean as opposed to BB cushion housed in sponges. I like that I can press the metal plate a couple of times to dispense the product and control the amount of product I need. The sponge is just like other BB Cushion sponges which I like and I can easily grab all the product straight from the metal pan to my skin. The texture of VDL Metal Cushion Foundation is quite watery, I can spread the product easily and yet, it gives medium to almost medium heavy coverage which surprised me the most! It covers almost like a concealer + foundation with the most lightweight formulation. The product can hide redness, undereye darkness and even out my skintone giving that healthy glow. 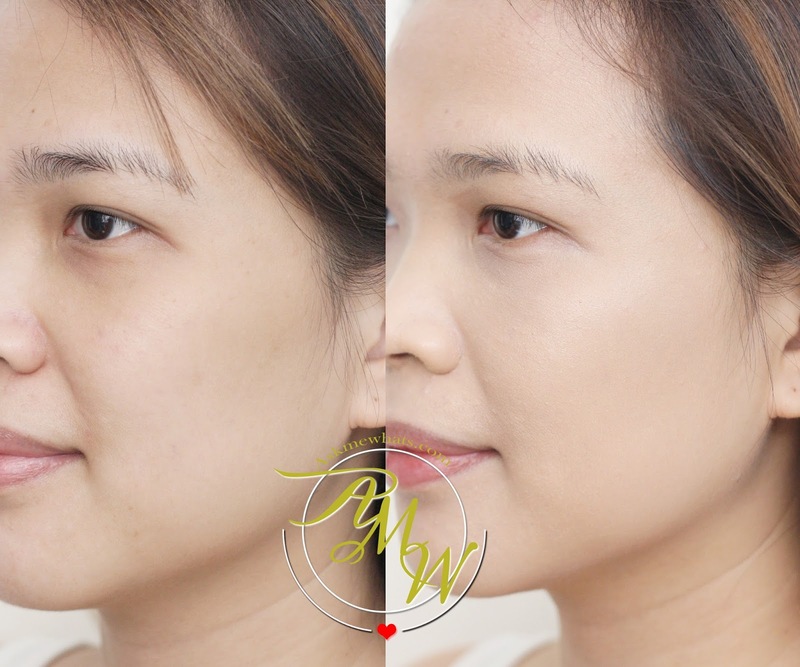 Just ONE Layer of VDL Metal Cushion Foundation all over face with a dabbing motion. As much as I love the sideview comparison and how perfectly PERFECT my skin looks (almost just like K-Drama actresses!) The full face effect isn't what I'm used to! Maybe, it is the shade of the foundation that's wrong but what I realized is that the foundation gives a super brightening and glowing effect! It's almost like applying highlighting product all over the face! Aside from that, ONE CON that I can think of is the surprising fact that it can enhance dry areas around my face, yes, the product is hydrating but because of the "brightening" factor, it can actually enhance certain dry spots. That's ME wearing VDL Metal Cushion Foundation Shade 205 ALL OVER Face. Ending is, this is definitely a wonderful brightening cushion with good coverage + longevity (in terms of how it can last me the whole day and works for 4-5 hours on oily skinned users --- tested this on my friend!) The negative part is the flashback it gives on photos and gives that super unnatural skintone in person. Conclusion? This is a great base product if applied on key areas of the face only and set with a mattifying powder to lessen the unnatural tone. VDL Metal Cushion Foundation? You are almost there, you nearly hit the nail but I guess you only need to include more shades. I got my VDL Metal Cushion Foundation early this year through Althea but it's currently unnavailable. How do you find the VDL Metal Cushion Foundation? Waah i like! Mas sanitary compared to cushion foundies plus the brightening effect is love!! yes, but oh my on the super bright complexion! The metal packaging reminds me of cushion I saw in miniso.